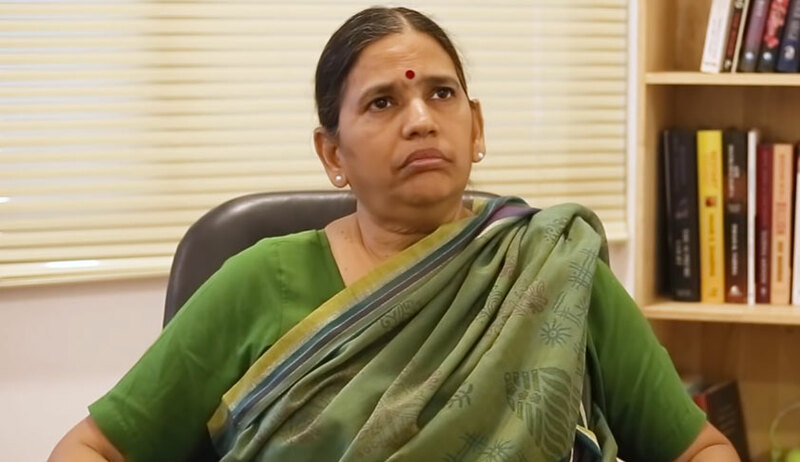 In a temporary relief to lawyer-activist Sudha Bharadwaj, she will not be taken out of Haryana till August 30, as the Chief Judicial Magistrate (CJM) recalled the earlier order of transit remand to Maharashtra Police. The recall was made following the directions of Punjab and Haryana High Court in the habeas corpus petition filed on her behalf. Earlier in the day, at 7.40 PM, the CJM had given transit remand of Sudha Bharadwaj to Maharashtra police, for taking her to Pune in relation to alleged maoist link in the Bhima-Koregaon violence. The Chief Judicial Magistrate, Faridabad, Ashok Kumar, recalled this order after a dramatic midnight hearing at his residence. 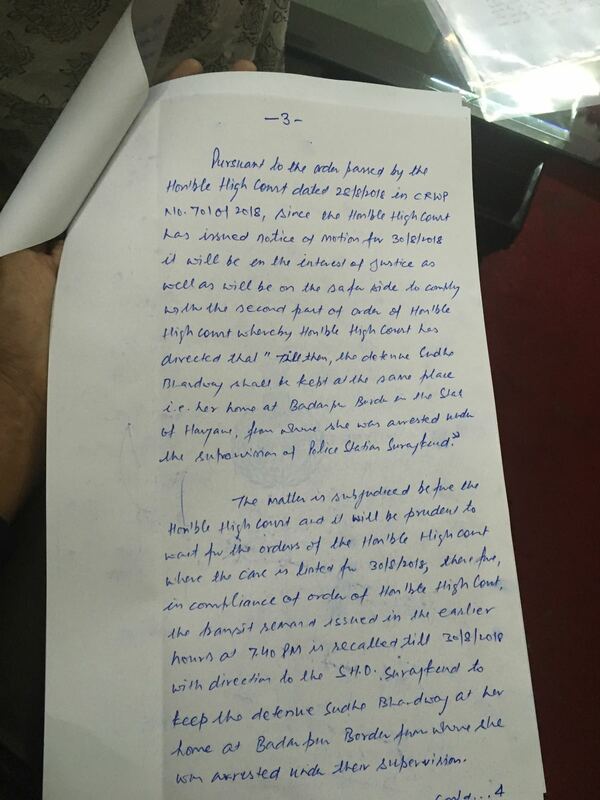 After her arrest by Maharashtra Police from her residence at Badarpur border in Haryana, a habeas corpus petition was filed in the Punjab & Haryana High Court through Ankit Grewal, seeking her release from the alleged illegal custody. 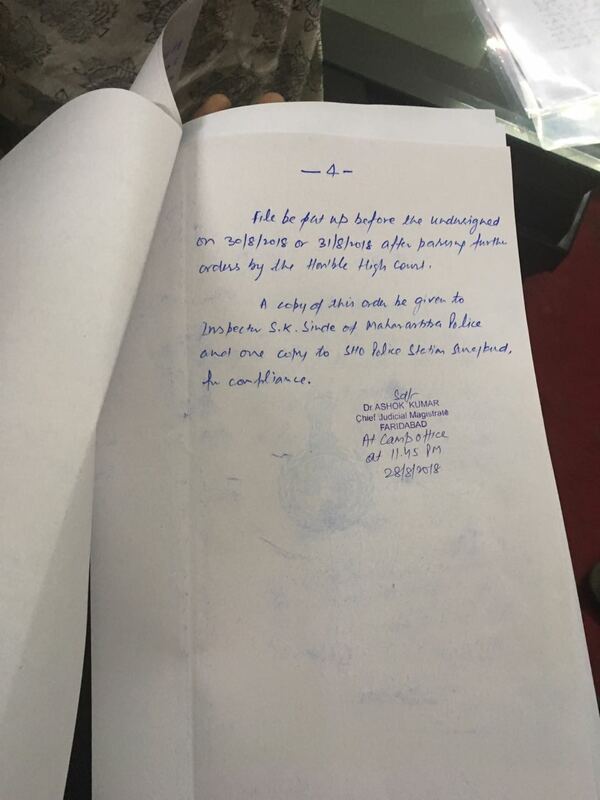 Issuing notice of motion for August 30, Justice Arvind Singh Sangwan of the High Court directed to keep Sudha Bhardwaj at her house from where she was arrested at Badarpur border under the supervision of SHO PS Surajkund, Faridabad, Haryana until then. Meanwhile, Sudha Bharadwaj was being taken to the airport by Maharashtra police as per the transit remand ordered at 7.40 PM. 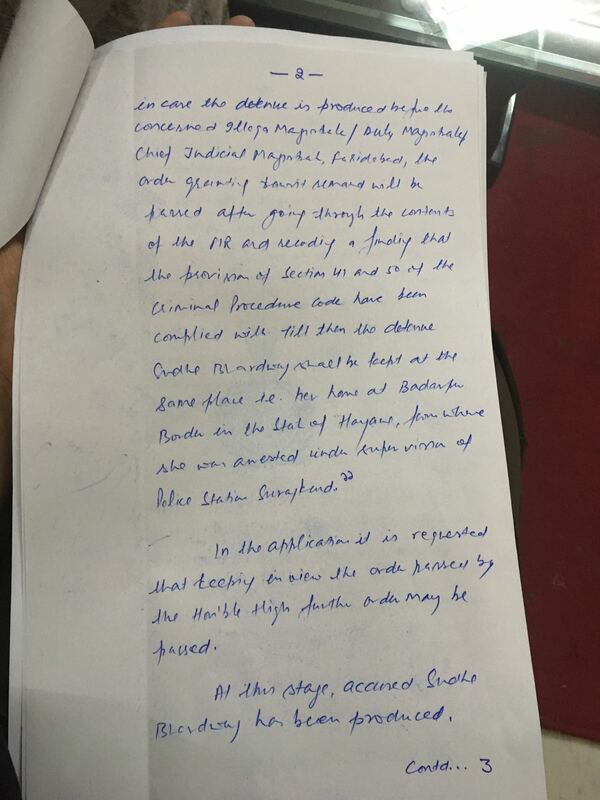 As soon as the High Court order came, the police took her back to the CJM, filing an application to issue further order in compliance of the direction of High Court. This led to a dramatic session midnight hearing at the residence of CJM. 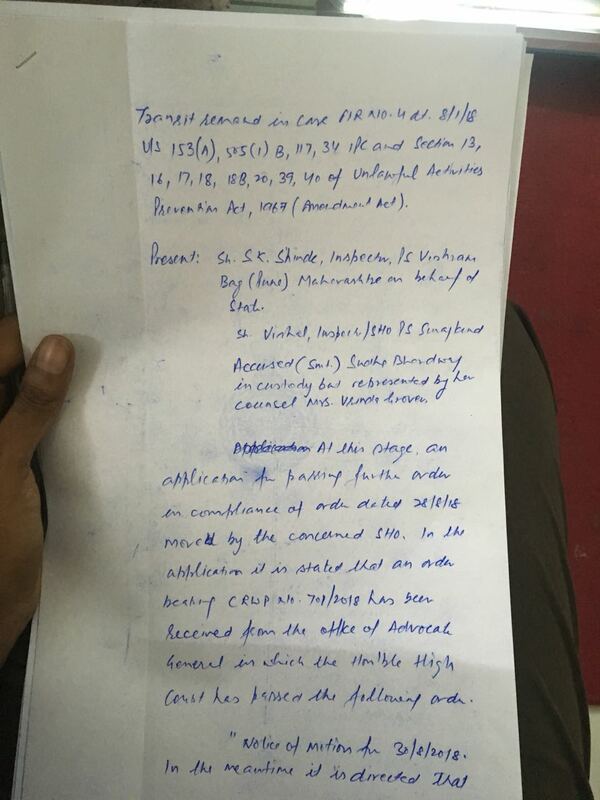 At about 1.30 AM, the CJM issued the order recalling earlier transit remand, stating that "the matter is subjudiced before the Hon'ble High Court and it will be prudent to wait for the orders of the Hon'ble High Court where the case is listed for 30/08/2018." The CJM noted that it will be in the interest of justice to recall the earlier remand. The CJM therefore directed Station House Officer, Surajkund, to keep her at her home at Badarpur Border from where she was arrested under his supervision till August 30. The matter has been directed to be put up before the CJM on August 30, after the passing of orders by the High Court on that date. Vrinda Grover appeared for Sudha Bharadwaj. On August 28, the Maharashtra police arrested several activists from different parts of the country alleging Maoist links. Apart from Bharadwaj, the police arrested Vernon Gonsalves, Gautam Navlakha, Varavara Rao, Arun Ferreira, Kranthi Tekula after raids in their residences.The raids and arrests were carried out as part of a probe into the violence at Maharashtra's Koregaon-Bhima village, triggered by an event called 'Elgar Parishad' (conclave) held in Pune on December 31 last year. Several activists have issued a joint statement condemning the arrest "as an attempt by the government to strike terror among those who are fighting for justice for the marginalised".